This article first appeared in Unlisted & Unlimited, The Edge Malaysia Weekly, on January 11 - 17, 2016.
recognitions under his belt, including the 2004 Seacology Prize, 2006 Asean Energy Awards and the 2008 Outstanding Young Malaysian award. He was also a finalist in the Rice Bowl Startup Awards 2015. Anyone looking at him today would think success comes naturally to him and that it was all plain sailing, but nothing could be further from the truth. Lasimbang stumbled into entrepreneurship when he was in his village in Sabah 18 years ago trying to wait out one of the worst financial crises in the country’s history. He had just graduated with a degree in engineering and there were no jobs to be had. The Kadazan, who hails from a tight-knit community, decided to return home, along with the other youths who had either lost their jobs or were unable to get one. Rather than being idle, they looked around and found that there was much to do in their own backyard, so to speak. So, they formed Tonibung (Friends of Village Development) to work on improving their village. No one had any doubt that the moment the crisis was over, they would get back to the city. But in Lasimbang’s case, at least, that was not quite how things turned out. “Initially, our idea was just to organise ourselves to do something for the community while waiting for the economy to recover and maybe look for a job. But soon, it became an opportunity to serve underserved Malaysians, particularly in rural and remote areas,” he says. agricultural circumstances. While being involved in its first project, Lasimbang became aware that much more work was needed in the rural areas. “One of the first villages I was assigned to was a very remote area in Pitas in northern Sabah. If Sabah is the poorest state, then Pitas must be the poorest area in Malaysia. Nothing to be proud of, but we did something there. We started an irrigation system, a basic water and sanitation project. That was the realisation that there were still a lot of things we needed to do,” he says. Over the years, the organisation has turned its attention to rural electrification, focusing predominantly on micro-hydroelectric systems that would replace small petrol and diesel generators as a means of powering villages. Among other things, micro-hydroelectric systems provide clean energy continuously, unlike the generators, which need to be refuelled. dedicated to supporting indigenous communities in Sabah, and JOAS (Jaringan Orang Asal SeMalaysia), a national body that coordinates and researches the conditions of indigenous communities, including their human rights, education and economy. “My previous work with these two organisations gave me the background and skills I needed. It served as guidance of which direction to take when going into social enterprise ventures,” says Lasimbang. PACOS Trust even provided the opportunity for Lasimbang to get a second degree in mass communications at Universiti Malaysia Sabah. He says he believed that the added knowledge would increase his media literacy, making it easier for him to highlight the issues faced by indigenous communities. 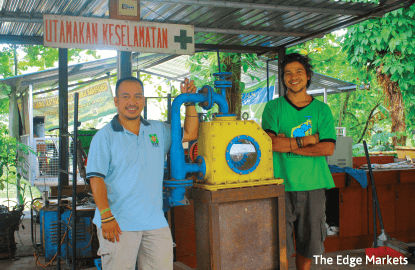 As Tonibung was a non-profit organisation, it relied on grant funding from overseas, mainly from Green Empowerment, a renewable energy and rural community development organisation based in Portland, the US. However, by 2009, Tonibung was no longer eligible for most of the grants that were available to Malaysia. So, Lasimbang, who had seen the good brought about by its work over the years, was fully committed to continuing this work and looked for other means to fund his projects. He ended up using his life savings and a piece of family land to set up PRE, which provides consultancy (including site surveys and feasibility studies), system design and custom fabrications for renewable energy needs. It has developed solar off-grid power systems, solar power bank kits and micro-hydro systems. PRE’s micro-hydro system uses the energy of moving water to power a hydroelectric turbine that can generate up to 100kW of electricity. It conserves biodiversity by protecting the watershed, ensuring that forests near the river are kept intact and the environment is preserved. This is ideal for the electrification of small areas that are near rivers but with little or no access to electricity. “We want to provide the best and most appropriate technologies for rural applications. Of course, it can be used in cities if you choose to remain connected to the green energy sector. We also want to provide these services at the most competitive prices,” says Lasimbang. To bring down costs, he and his team build the turbines for the micro-hydro systems on their own and are now 80% self-sufficient. PRE plans to manufacture its components in situ, making its turbines a truly Malaysian product. “We build the turbines [including the casing], assemble them and put in the mechanical components. The remaining 20% is actually the generator and controller. So, there are still some electronics that we cannot build, mainly because some of the designs are patented, so we have to buy the technology,” says Lasimbang. After some time, PRE managed to catch the attention of an impact investor from Canada called the Lundin Foundation. After reviewing PRE’s model, the foundation agreed to give it a grant. “Lundin has been very helpful. Apart from investing in us, it sends experts to look at our business model to see what needs to be done, what needs to be improved and what needs to be further defined. Our model is very new, so to get more people to invest, we need to explain a lot of things,” says Lasimbang. PRE is also partners with Green Empowerment. “The organisation promotes green technology. It looks for organisations like ours — Tonibung and PRE — and introduces us to organisations with the appropriate technologies for the purpose of joint ventures and partnerships,” says Lasimbang. UK-based Engineers Without Borders is also a partner of PRE. It sends two placement engineers every year who spend six months helping Lasimbang and his team with R&D and increasing its level of professionalism to better compete with other brands. “These engineers are not fresh graduates; they are professionals. They also help us manage things that we had never thought of, such as the product life cycle,” says Lasimbang. Being a passionate Orang Asal activist, he realises that while the communities in the rural areas of Sabah have a lot of marketable resources, they still live on a subsistence economy, or relying on natural resources to provide for their basic needs, and poverty has forced many of the youth to drop out of school. To make matters worse, they have no access to basic amenities. 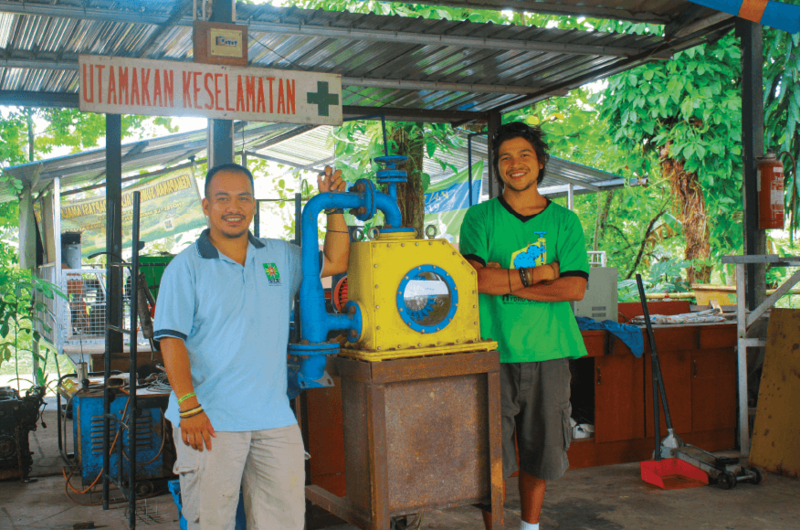 Lasimbang believes that Orang Asal communities can be empowered through renewable energy projects. “The model is community-based. 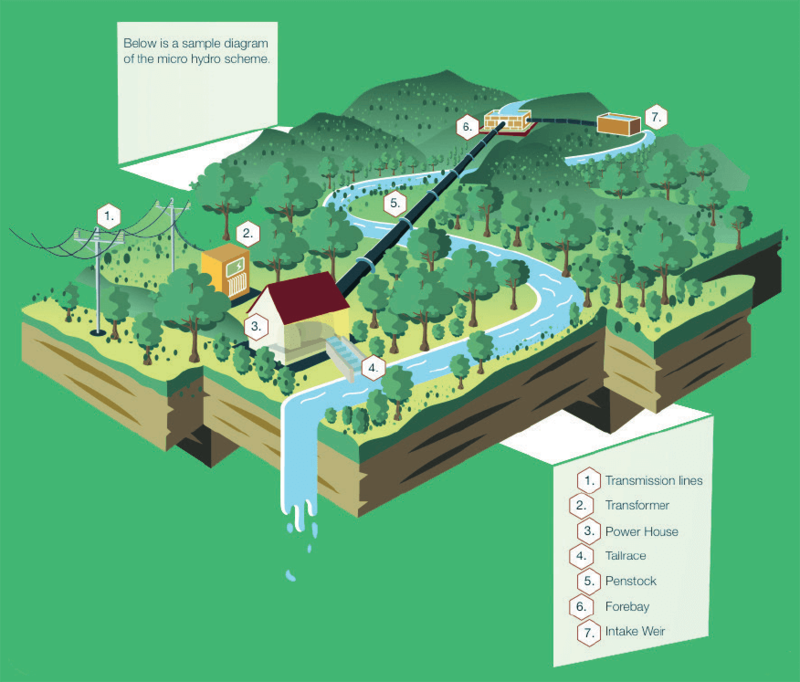 For the micro-hydro systems, we don’t own the system; we only have a stake in the system until the last payment is made. After the full payment has been made, we will hand over the system to the community and it will manage the whole fund — the money the villagers pay for the electricity generated from the system,” he says. The AirAsia Foundation is providing funds for six of PRE’s pilot projects. With this money, Lasimbang will build a system that empowers the Orang Asal communities. “When we were working with Tonibung, we saw that the communities had no abilty to pay because they didn’t have cash. So, we designed systems that would help them convert their natural resources, such as rice, fish and wild game, into cash,” he says. To make this work, Lasimbang created a socioeconomic centre that serves as a trading point for the community to pay for the electricity it uses, with goods rather than cash. “If they don’t have money for the tariffs, they can pay with rice. The rice grown here is of premium quality and very sought after. We will process and pack the rice and then sell it. That’s how we help the community pay for the system,” he explains. Four projects have been implemented with the help of the AirAsia Foundation. Although it has not been easy, Lasimbang is definitely seeing improvement. “One of the challenges in turning a subsistence economy into a cash economy is that the orang kampung (villagers) don’t understand how money works — what’s an investment, how to invest, what’s adding value and all that — because in a subsistence economy, you take what you get. There’s nothing like one plus one equals three; it’s only one plus one equals two — it’s very straightforward. But in a cash economy, you can add value to money. These are the things we try to educate the communities on,” he says. Another challenge PRE faces is awareness, as there are a lot of sceptics when it comes to social entrepreneurship. When Lasimbang tries to pitch for investments, many potential investors are not convinced that the community can pay them back. “They say, ‘You think this community can pay you when they don’t have money?’ We know that they don’t have money, that’s why the model to develop the in situ economy is important. For the model to be successful, you have to invest not only in the hardware but also in the planning and programmes to empower the community,” he says. PRE has a small team of about 10 people managing six micro-hydro projects and 20 to 30 small home solar systems a year. It also has apprentices in its training programme, who are taught the theory behind what it does and who provide labour at the workshop for a basic salary and free accommodation. The company works symbiotically with Tonibung, its parent organisation. The latter manages the community projects, develops them and gets funding while PRE provides all the technical support, from consultancy to the supply of equipment. How long will it take for PRE to make money from its projects? Lasimbang had initially estimated that it would take five years to see a return on investment, but he had to extend the timeline, mainly because it is a steep learning curve and most of the communities it helps are unfamiliar with the workings of a cash economy. So, PRE has to keep going back to the drawing board and revising its socioeconomic models. The company earns RM30,000 to RM40,000 per project, which is very little considering the amount of work that goes into it. PRE has also been affected by the depreciation of the ringgit as most of its spending is done in US dollars. Lasimbang says the company relies on commercial projects to make money. With the community-based projects, it simply breaks even and the money is just enough for it to restock supplies and support the staff. But despite the fact that PRE depends on its commercial projects for profit, Lasimbang has done nothing to market the company’s business. Instead, he relies on word of mouth to promote what the company has to offer. Some of its previous commercial clients include Borneo Eco-Wellness Resort & Spa in Lok Kawi, Sabah, and Universiti Malaysia Sarawak (Unimas) Paramapuh in Miri, Sarawak. PRE is still trying to get more people to invest in its pilot community projects. As in the first five to six years, it has to try out the business model in different communities to know whether it will work. “I am hoping that one of these days, we can have one or two projects in Peninsular Malaysia. I have done few micro-hydro solar projects with the Orang Asli, but they were purely on a grant basis. We have received grants from the United Nations Development Programme and companies’ corporate social responsibility programmes. The last one was from the Selangor government. But we are trying to see whether the model — the revolving fund — can be implemented in Orang Asli communities in Peninsular Malaysia,” says Lasimbang.